There are some secrets that even the best liars can't keep. Pretty Little Liars (2010-17) has always presented plenty of on-screen drama, but in real life, there have been some crazy moments surrounding the show that might even make Uber A blush. 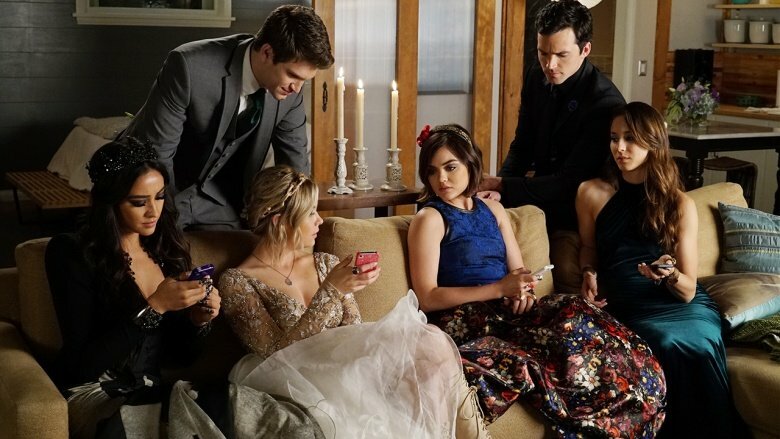 Whether you're Team Haleb or Spaleb or even Spoby, you won't want to miss this essential history of the Liars. 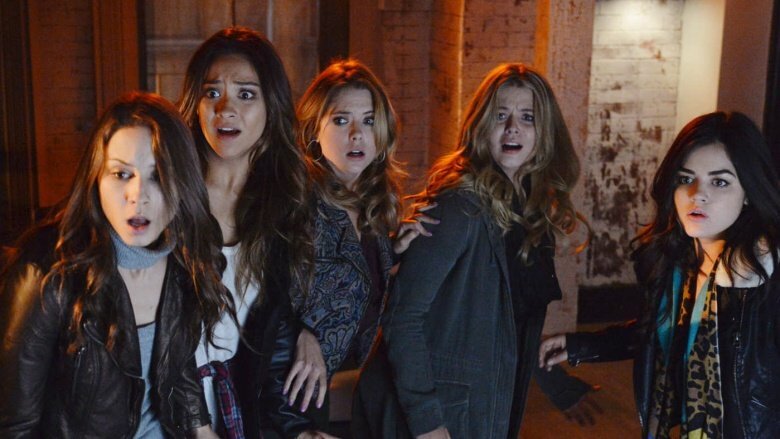 Most fans probably know that Pretty Little Liars is based on the Sara Shepard book series of the same name, but there's more to its history than that. Alloy Entertainment, a book-packaging and television production subset of Warner Bros. Television, came up with the idea to create a series that would serve as a sort of "teen Desperate Housewives"-slash-"murder mystery with a soap" series. Alloy then chose Shepard, a ghostwriter at the time, to pen the novels with the hopes that the story would become must-see TV. Pretty Little Liars debuted on June 8, 2010, which was, uncoincidentally, the same date Shepard's eighth (yeah, Shepard was a writing machine during the show's development phase) installment, Wanted, was released. Wanted was supposed to be the final chapter in the Liars books, but after its release, Shepard decided to carry on. At the time of this writing, she's added eight additional installments to the collection. There are now a whopping 16 books (plus three companion novels) that create four major arcs to the overall series. Meanwhile, Pretty Little Liars holds Freeform's title for highest-rated debut and longest-running show and boasts a cult following to rival Alloy's other creations, which include The Vampire Diaries and Gossip Girl. Actress Ashley Benson (Hanna) was the person who suggested the Pierces' pitch-perfect "Secret" for the show's intro. Benson played the track for some of her co-stars, and they agreed it was a must for the episode opener. They took it to creator I. Marlene King, who also loved it. King told The Hollywood Reporter, "People think that song was written for our show—it's so perfect." Pretty Little Liars might have pocketed the picture-perfect cast, but the halls of Rosewood High School almost looked a little different. For starters, Ashley Tisdale was originally asked to be one of the leading ladies but turned down the part to focus on the now-defunct Hellcats (oof). There's also a rumor that reality star Kylie Jenner was once in consideration for a role on the show. Imagine what "kraziness" would have happened if Keeping Up with the Kardashians had actually infiltrated the PLL set. Several series stars originally auditioned for very different roles than what they got. Sasha Pieterse (Ali), Lucy Hale (Aria), and Bianca Lawson (Maya) originally tried out for the part of Hanna, while Shay Mitchell (Emily), Tammin Sursok (Jenna), and Janel Parrish (Mona) initially auditioned for the part of Spencer. Meanwhile, Keegan Allen (Toby) came out for the much smaller part of Wren Kingston—lucky break that he didn't get that one—and Brendan Robinson (Lucas) read for the role of Mike, Aria's oft-absent little brother. Brant Daugherty (Noel) initially took aim at two other roles: Ezra and Toby. Before they were besties on-screen, Benson and Hale became pals through MySpace. Hale tweeted that they've known each other since they were 15 after they "creepily met on MySpace (don't ask)," to which Benson replied, "what were we thinking???" Guess they're taking that backstory to the grave. What's in a name? A lot. In fact, the name Ali DiLaurentis has not one, but two aspects of significance. Shepard's sister is named Alison, and the character's surname is an anagram for Liars United—which makes sense since she is the one who brings all the girls together. Speaking of Shepard, you might have seen her face without realizing it on two different occasions throughout the show. 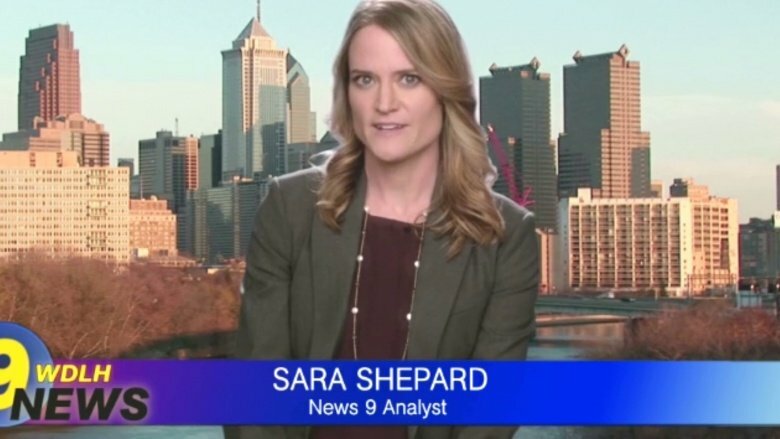 The author appeared in the show's first season as a substitute teacher for Mr. Fitz's class, and she showed up again in Season 5 as a news reporter covering Ali's trial. Fans of Gilmore Girls might also get a major case of déjà vu while watching PLL because several of the buildings in Rosewood and Stars Hollow were used by both shows on the Warner Bros. studio lot. 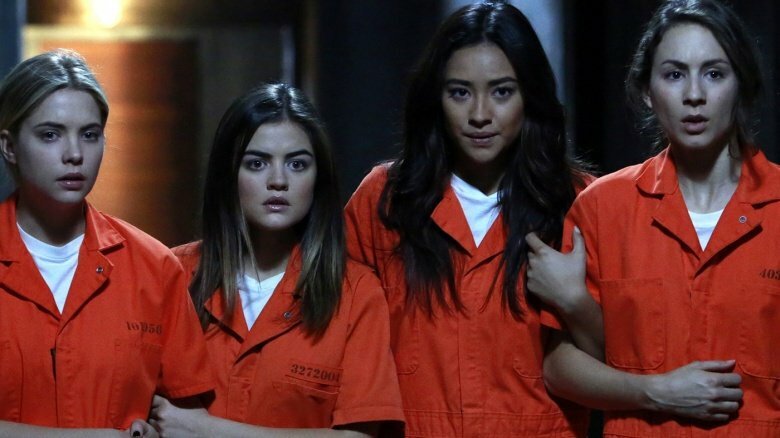 The Liars may be great at burying their dirt (with the bodies) on screen, but in real life, they've been a little less discreet. For starters, two male members of the cast landed in hot water legally. Actor Brandon Jones (Andrew) was arrested in March 2016 for alleged assault with a deadly weapon, and Parker Bagley (the original Jason) pleaded guilty in 2013 of stealing $7,000 worth of jewelry and electronics from the home of an acquaintance. Other cast snafus have been a little less intentional. For instance, in 2015, Benson drew ire from the Instagram crowd after she posted a sponsored picture of herself wearing a lion costume, dubbing it a "Cecil the Lion" look. Given the real Cecil's death by poaching, Benson attracted a ton of backlash and quickly apologized, promising that any proceeds from her deal with the company would go to an animal conservation fund. Troian Bellisario also found herself facing the social snap-back after criticizing Taylor Swift for being a "false" feminist. The show itself has been the source of some bad blood. There has been much debate over concerns about the (perhaps illegal) age gap and teacher-student impropriety pertaining to the on-screen relationship between Aria and Mr. Fitz. Controversy also brewed over some allegedly extreme photo-shopping in a cast magazine spread. Perhaps the biggest flub occurred when the show introduced its first transgender character as the sociopathic stalker who'd been tormenting the girls—that trope was controversial enough on its own, but then the show's official Twitter page shared a seemingly transphobic tweet by captioning a picture: "He. She. It. Charlotte." To celebrate the seventh and final season of Pretty Little Liars, showrunner King took a trip down memory lane to detail some of the most dramatic moments from the actresses' auditions—those backstories were almost as intense as the "A.D." episodes. King told Variety, "I remember [Benson] coming in for her audition and she was in tears because she was on a show called Eastwick and she had just found out it was canceled." Mitchell wasn't the first choice for her role coming in but ended up besting her competition in the screen-testing room. Hale didn't even have to audition thanks to her work on Privileged (2008-09). Bellisario was sent away for not dressing the part but came back with enough pizzazz to win the role. Last but not least, Pieterse almost lost the gig because she was only 12 years old at the time of her tryout, but when she outperformed her elder peers, that was that. Although Spencer often seemed like the most well-adjusted member of the Liars, her real-life counterpart was suffering. In a gripping Lenny Letter, Bellisario revealed that she suffered from crippling mental health woes, including a difficult battle with an eating disorder. She wrote, "There is a part of my brain that defies logic. Once, it completely convinced me I should live off 300 calories a day, and at some point, it told me even that was too much. That part of my brain is my disease, and there was a time when it had absolute authority over me… It almost killed me, and you can see that even though I have lived in recovery for ten years now, it still finds loads of fun, insidious ways to thwart me to this day." Despite her personal battle with body image, Bellisario defended GQ after it was accused of Photoshopping the cast in its magazine spread. Via Instagram, she said that "looking very blown out and perfected was obviously what [GQ was] looking for. Great. Cool. As long as we acknowledge how it was achieved so we know it's not real." The actress added, "This industry seems to invest more in perfection than in flaw. But flaw and individuality, to me, are what make a human being interesting, they make our stories worth telling. (Unfortunately the flaws don't usually sell products or magazines)"
Emily's journey toward self-acceptance over her sexuality was one of the more compelling subplots of the series, and life seems to be imitating art for Mitchell. As a result of that narrative arc, the actress has had to field more than her fair share of questions about her own sexual preferences, and in June 2016, she fought back against the inquiries by refusing to be beholden to traditional labels. She told Cosmopolitan, "When I started, people were like, 'What are you?' I'm like, right now I'm dating a guy. I don't know what it's going to be in three years. You love who you love. Black, white, polka-dot, that's what my dad always said. I'm never going to label myself. I could be 50 and dating a woman and then what? I said I was straight and now I'm not?'" She credits her family for keeping her open-minded. "My parents never said 'he' or 'she' to me or my brother, always 'they,'" she said. "If I started dating a girl tomorrow, I could text my dad, 'Bringing new girlfriend over.' It wouldn't even be deserving of a phone call." Emily would approve of that attitude, for sure. Of all the ladies, Hale seemed to be subject to the most scrutiny in the gossip arena. She was often the one cited as the odd woman out among the actresses, who were often depicted together in group photos—some of which Hale was noticeably absent. 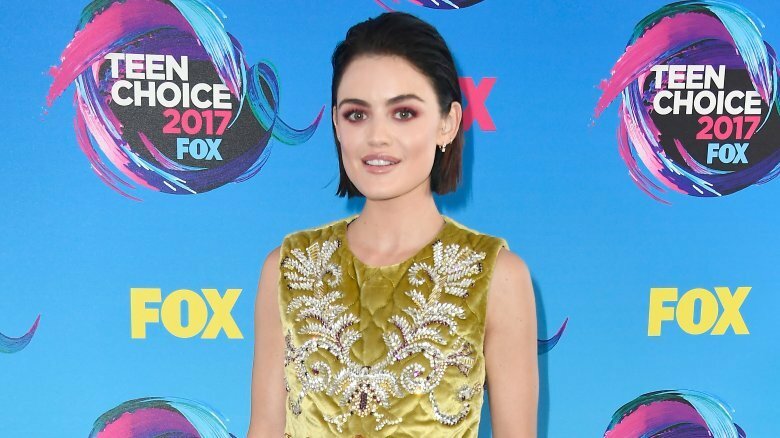 Though Hale and her co-stars have seized opportunities to disprove the feud rumors, she admitted their dynamics weren't always perfect. "We all sort of have our different friendships, and we keep in touch in different ways," she said. Regardless, the ladies connections were forever solidified when the actresses all got matching tattoos on their "'shh' fingers." Of all the shocking behind-the-scenes gossip bits shared by the cast on Ellen's Show Me More Show, the revelation that Hale had the hots for her teacher on and off-screen was perhaps the most jaw-dropping. 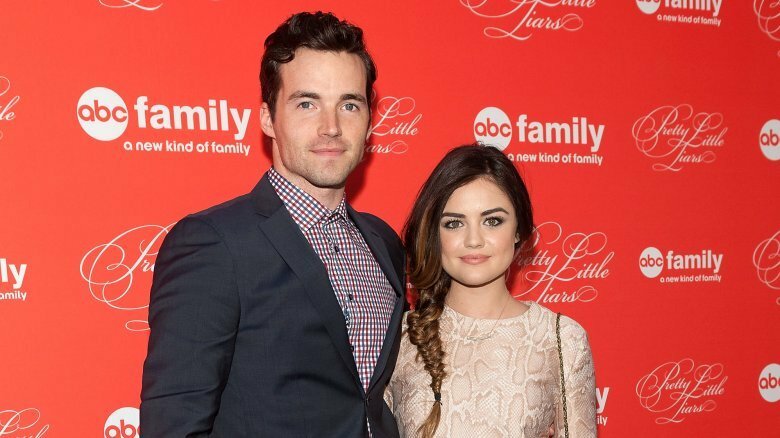 When asked if she'd ever had a crush on a co-star, Hale admitted, "Ian Harding, Season 1, whatever I was 20." The final days of any show are difficult, especially when some cast members wrap before the others, but for Pretty Little Liars, the team came back together one last time for a collective farewell among the cast, crew, and creatives. As King wrote in The Hollywood Reporter, "One by one, we said goodbye to our cast as they were 'series wrapped.' But then something amazing happened. They came back. On the last day of filming, actors, department heads, executives, directors and our entire office staff came to the set. Video village grew from a handful of people to a hundred. Late into the night, I called 'cut' for the last time on Pretty Little Liars. 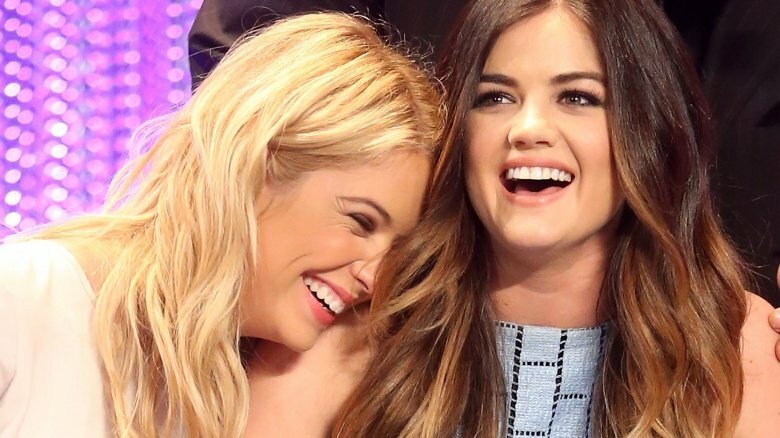 I'll never forget the cadence of our first A.D. announcing, 'Ladies and gentlemen, that's a series wrap on Lucy Hale, Ashley Benson, Shay Mitchell, Sasha Pieterse, Troian Bellisario…and Pretty Little Liars.'" That's a gulp-tastic moment if we've ever heard one.